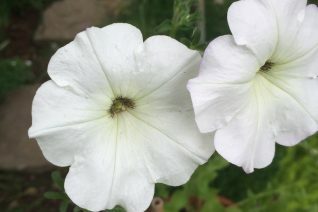 We love this simple species Petunia not for just its prolific white and green flowers but the intense sweet fragrance that they emit. To 18″ tall and somewhat trailing for full sun and rich well drained soil with regular summer water. Ideal in containers where its fragrance, which intensifies at night, can be enjoyed. Remove spent flowers to encourage more. Old fashioned plant with a new lease on life.